There is a difference between practice and training. Practice will of course improve technique, efficiency, and specific muscular endurance – but will generally end in a plateau. Training, however, is a planned gradual increase over time focusing on a specific outcome. The key being using an incremental modulation to get there. This week a new bouldering gym had it’s soft opening in the city we live and train (Halifax Nova Scotia). 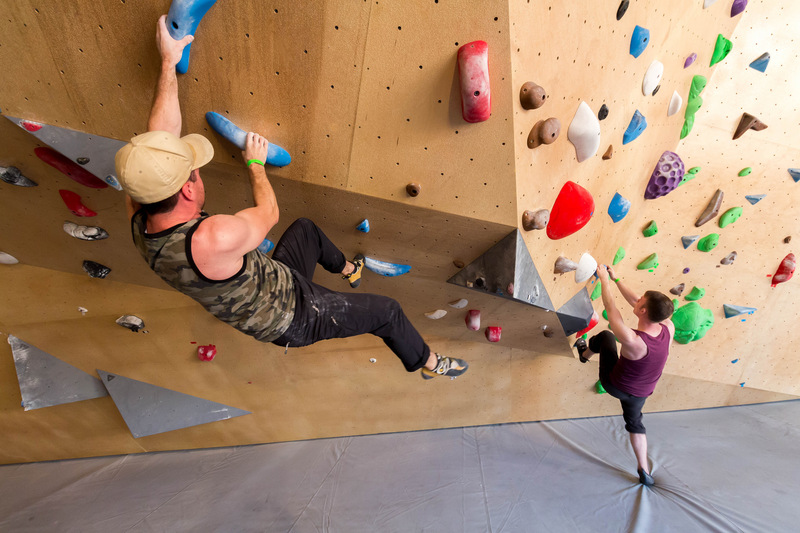 Seven Bays Bouldering is a converted auto garage with shiny new holds, padded floors, and a brewery right next door in the heart of hipster town. The soft opening was a fantastic event. Locals came to climb world class routes, eat world class food, support their friends and check out the new diggs. Over 500 people RSVP’d to the event and over 100 people bought climbing related passes on Day 1 which is a huge boost for their longevity. Having a gym walkable from home and work is too good to pass up! Which brings me to the questions of this post; How does Bouldering fit into an Alpine Training program? What you’re reading is as much an explanation as it is a question about how you alpine enthusiasts fit bouldering into a program focused on high volume low intensity training. Bouldering being the exact antithesis of this. Where we live the bouldering is great. Not good. Great. So with the coastal bouldering season upon us and a new bouldering gym opening it is difficult to not try to squeeze it into our Alpine Training Program. But how to make it training rather than practice? This is the crux. Chapter 14 “Training by Climbing” of Steve House’s Training for the New Alpinism is a deviation from most of the book in it leans heavily on climbing for the majority of a complete balanced program. The general outline remains the same – Transition, Base Strength, Continued base with Muscular Endurance (where we find ourselves today), Conversion, Peaking. The following is paraphrased from Chapter 14 – it is not representative of the standard program. Transition Period: Climb lots of pitches that are generally easy for you in preparation for the base period. Hold yourself back. Trust the process. Add 5 percent volume of climbing and scrambling per week. Complete a general strength cycle (two days per week climbing, the same two days per week general strength routine). Bouldering and weight training may count as strength training but work only boulder problems you can flash. Base Period: Develop a resistance to fatigue and get accustomed to a high volume of work. Bouldering for Max Strength twice per week an action packed hour at most. Do not go to failure. Base Period Muscular Endurance: Your endurance sessions will mimic a typical sport climbers day. Climbing to failure is OK. Make the hardest route of the day your 3-5th pitch then gradually get easier as fatigue takes over. Hit your programs recommended hours per week. Be sure this all falls into a continuous gradual increase by planning everything out ahead of time. When Matt and I started into this program my initial impression was that bouldering and sport climbing would be largely irrelevant since our goal is long moderate alpine routes in the Rockies. However as we have progressed in volume, gradually increased our strength & fitness, and seen real results in efficiency and endurance I have come to believe that building bouldering in (as long as we meet our other hours) as the Max Strength portion of the program will ultimately improve outcomes. Congratulations to Seven Bays on a successful opening. I am looking forward to slowly increasing my max strength volume and beer volume at your gym / cafe / bar. 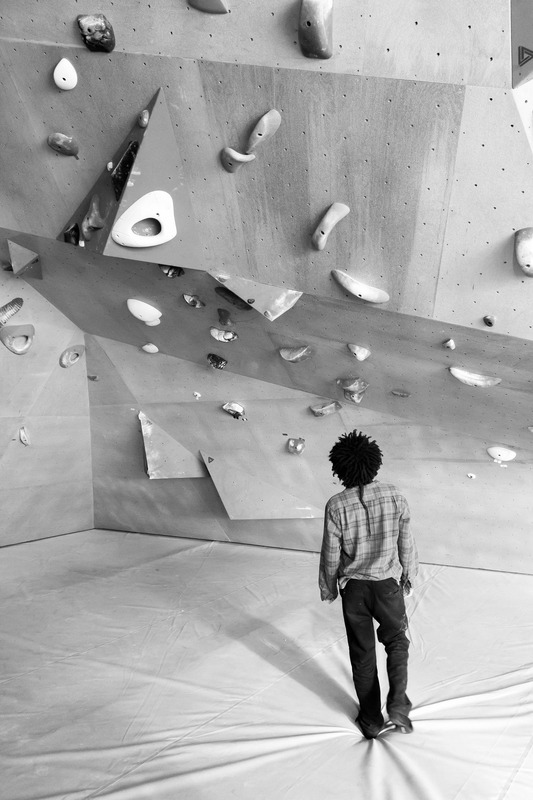 How do you fit bouldering into your training program? Am I rationalizing (fitting the square peg of bouldering in the round hole of alpinism)? Any recommendations on how to do this? If you boulder for 3 hours will you count all 3 hours as Max Strength? Great question, James. I’ve also been wondering what to do with the time I’ve spent bouldering, since it doesn’t correspond neatly to the definitions of max strength or muscular endurance training given in House and Johnston. I’m not sure that it qualifies as max strength, though. I understand max strength workouts to mean one-rep sets that work on very specific muscle groups. For example, if you want to increase your pull-up strength, load up a weight belt until you can only do one rep with it. I suppose that there are bouldering moves that you can only execute once, and if you want to perform that one max move in four sets of 1-2 reps, go for it. Bouldering could also be considered a muscular endurance workout, if you execute a series of moves that involve more than 1-2 reps focusing on a specific muscle group. If you were to work your way laterally around the climbing gym, for example, in a 5- to 10-minute series of moves, maybe you could call that muscular endurance. I’ve also worn my heart-rate monitor to find out what the aerobic characteristics of bouldering are. Predictably, my heart rate oscillated between zone 1 (55-75%) and zone 3 (80-90%). And because my bouldering practice typically consists of short periods of time on the wall (30 sec to 1 minute), there are lots of spikes HR-wise. I think the best way to think about bouldering, at least for me, is that it is a skill-building exercise. You’re building the neurological connections between your hands and feet, strengthening your core, and fine-tuning your balance skills. There’s also a lot of mental toughness training; there are lots of moves you can’t make at first, and gradually you push through that barrier until you can stick it. And because there are so many different muscle groups involved – which my body certainly reminds me of the next day, when I’m sitting here trying to type with what Germans call “Lego hands” – it really is a full-body workout. So to return to your original question, I think that bouldering doesn’t quite fit into the categories of aerobic training, max strength, or muscular endurance training, even though it has elements of all three. It definitely contributes to strength in ways that become very clear over time; I have much greater grip strength than I did just two months ago, and that with minimal time spent bouldering. Maybe keep track of it in your training log, taking notes about the time you spend bouldering, perceived rate of exertion, your heart rate data, and some general notes. If you notice improvements that you can assign to one of House and Johnston’s categories, then maybe that will provide a more definitive answer to your question. But yes, Lee, I agree with you. I’ve been going back and forth with James about this over the previous week and I’ve been saying it doesn’t count. This may be my natural bias against bouldering since I’m terrible at it. The consensus I reached with him, and myself, is that if you’re someone who already has a very high level of general fitness then maybe bouldering is a better use of time. For someone with a low-to moderate-level of general fitness that time is better spent improving fitness over specific bouldering skills. This represents the dichotomy between James and I quite well – he’s much more generally fit than am I in regards to climbing so I will get more benefit out of continuing our gym routine than he may. I think where this diverges is for people who are climbing VERY hard routes in an alpine environment. Climbing 5.8 doesn’t take top-of-the-line technique to pull specific moves so bouldering isn’t ever really going to help us out. However, if you’re planning alpine projects in the 5.11-5.12 and up range then I imagine that a)you’re already very, very fit and b)bouldering circuits of V5s will have a direct correlation to the moves you’ll be doing in the mountains. Hey Lee, Thanks for your thoughtful response. In my heart of hearts I know you and Matt are both right. There is likely no good place for bouldering in this program. The only way I can see it working is if I were to take a progressive 4×4 difficulty approach, tracked over time increasing by 5-10% in difficulty or volume per week. But bouldering is more than just training to me; it is social, it is fun, it is challenging. Likely this is where my previous plateaus arise from, an over reliance on a “Suns out guns out” mentality – not enough focus on the gradual increases coupled with recovery weeks. I do enjoy bouldering. Anything that excites me to be outside and active is hard to put down. For now I think I will clock my time “On the rock” while bouldering and log it under climbing hours. But still be sure to do long trad /gym laps with down climbing for the remainder of climbing hours. Have you had any luck with the paperback Training Log? Hi James, I didn’t realize that way back when, when I first mentioned the log, it hadn’t been released yet. I just saw it on Amazon and thought it was ready to ship. It was released on May 19, and although I ordered one quickly thereafter, apparently there is a lot of demand because now I have to wait almost two weeks until it ships to me. Perhaps you guys will get your copies faster… I’m also very curious about the log, so if you guys get it, make sure to post something. Steve House tweeted something recently about looking forward to the first review on Amazon, so maybe you can be the one!